Founded: Approximately 1640, two generations prior to 1685, when the church was built. Open: The Burying Ground is open year-round. The Church is closed between Christmas Eve and June, when it reopens for tours. An historic plaque in the Old Dutch Burying Ground describes the place as “one of America’s oldest cemeteries,” containing Dutch tenant farmers and their huisvrows (housewives? – it was undefined on the sign), Revolutionary War soldiers, and the characters of Washington Irving’s tale. 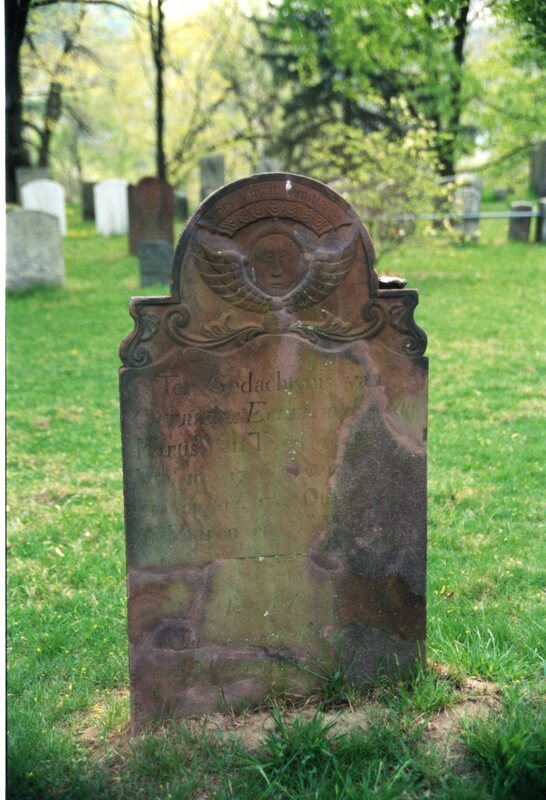 Many of the markers were made from rust-red sandstone instead of the gray slate used in the contemporaneous Massachusetts burial grounds. One of my favorite markers stood on the grave of James Barnerd. His epitaph indicated he’d been a sailor: “The Boisterous Winds and Neputns (sic) Waves have Tost me too and fro. By Gods decree you Plainly See I am Harbourd here Below”. I loved the carver’s creative spelling. Barnerd was 48 when he “departed this life” in 1768. Though discolored by exhaust from the street nearby, Barnerd’s sandstone marker was brightened by a cherub with sagging jowls. Above the cherub’s head floated something like a lotus blossom, probably a tongue of divine fire. Some of the sandstone markers have flaked and slivered until none of their inscriptions remained. I wondered if the deceased’s next of kin would have seen that as appropriate: just as their loved ones dissolved into the ground, the stones that remembered them crumbled to dust. I don’t think these markers had been intended to carry names three centuries into the future. It is only since the American centennial in 1876 that all soldiers of the Revolution were lionized as patriots worth remembering, even if they had only been foot soldiers. 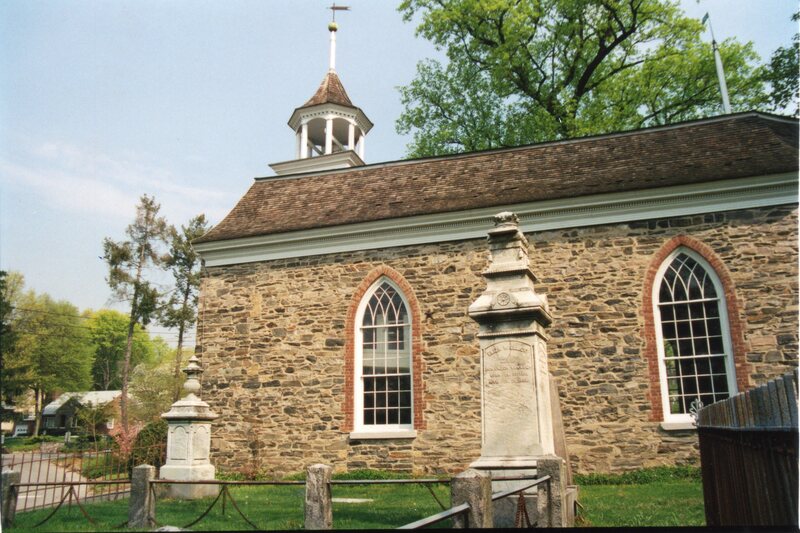 Frederick Philipse, the first lord of the nearby manor of Philipsburg, built the little church for his tenants in 1685. The bricks had been shipped from Holland, since the American brickworks weren’t yet up to the task. Writing in the 19th century, Irving called the building “The Old Dutch Church” and the name stuck. In his tale inspired by the names in the graveyard, the yellow stone and brick building had been whitewashed. The burial ground, probably dating back to 1640, preceded its church by two generations. Many of the graves had little metal signs poked into their dirt. I expected those would mark the graves of Ichabod Crane and the others, but that turned out not to be the case. The signs had been placed by the Tarrytown DAR (Daughters of the American Revolution — descendants of Revolutionary soldiers), the modern-day Friends of the Cemetery, and by the Grand Army of the Republic (survivors of the Civil War), whose markers must have been nearly 100 years old themselves. The last Civil War veteran is long in his grave himself. We searched and searched the sandstone tablets. Mason found the Crane family graves, but none of them named Ichabod. Eventually, I located Catriena Van Tessel, who died November 10, 1706. Although the rest of her epitaph was in Dutch, nothing seemed to connect her to Irving’s story. At the time of my visit, the Friends of the Old Dutch Church and Burying Ground offered tours on weekends from May to October. This may no longer be the case, since the tours aren’t mentioned on their web site (link below). You can however rent an iPad tour from the Reformed Church of the Tarrytowns, which continues to hold Sunday services and organ concerts in the Old Dutch Church. That link is also below. Sleepy Hollow Cemetery wraps around the Old Dutch Burying Ground. This entry was posted in Cemetery of the Week and tagged Legend of Sleepy Hollow, New York cemetery, Old Dutch Burying Ground, Revolutionary War graveyard, Sleepy Hollow Cemetery. Bookmark the permalink. Can i contribute with photos etc.from UK , and how do i go about it? So far everything up here has been either a photo I’ve taken or some ephemera from my collection. Do you have a site to show off your photos? Maybe I could link to it?